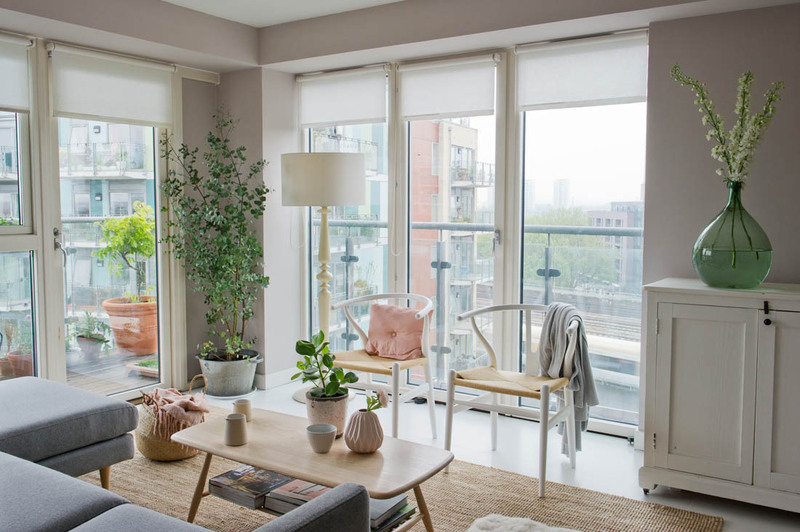 Enough of the teasing – my living room is finally ready to share with you, beautifully photographed by Katharine Peachey. 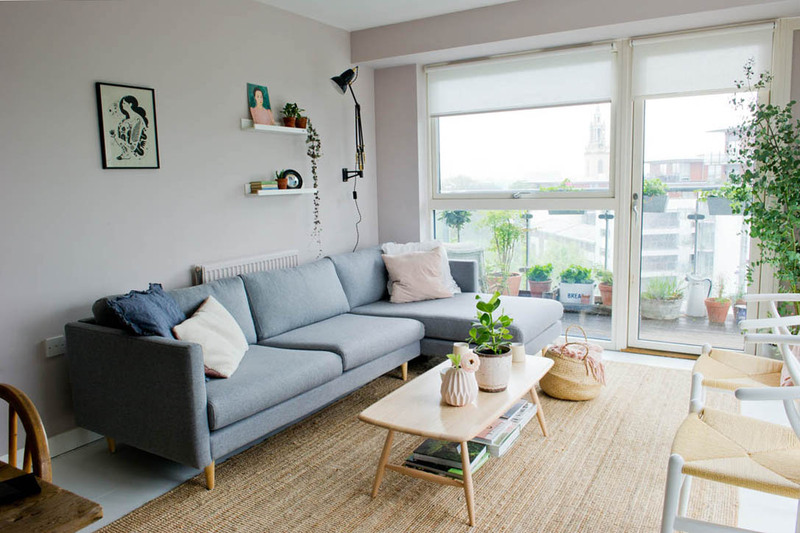 It took a lot longer than expected as the sofa was very delayed so I couldn’t pull the room together without that but I hope you’ll agree that it was was worth it in the end (we definitely think so and it has made not only this room but the whole flat feel completely different). 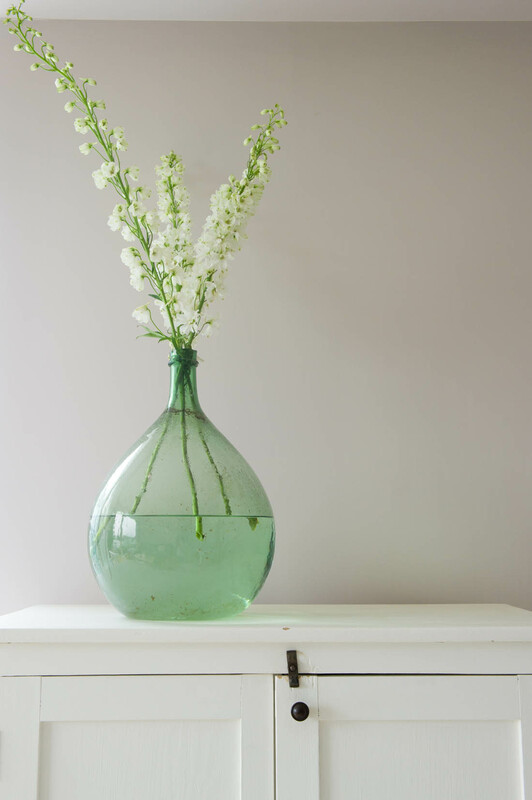 If you didn’t catch my ‘before’ post last week head over to read it here and see what the room looked like before I redecorated and a bit of the decorating process. 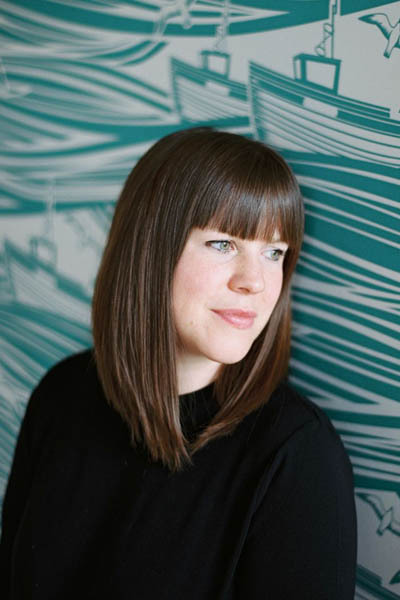 I wanted this space to feel lighter, fresher, simpler and more cohesive, as well as working better on a more practical level (it had to be dog friendly and allow Jules and I to use the room in the evenings and for eating without being squished on a sofa that was too small or perched at a table shoved against the wall). I also wanted this room to tie in more with the style of our home office and bedroom to make the whole flat flow better. As i explained in last week’s ‘before’ post, the first thing I did was to paint the room in one of Farrow & Ball’s new colours. I chose Peignoir, which is pink with a big dose of grey and it changes colour from the softest of blush pinks, to dark grey to mauve depending on the light and weather. It is a wonderfully calm feeling colour and I decided to base the colour scheme around its two components of grey and pink. I simply turned the dining table around and installed a hanging pendant over it and both of these changes have made it feel 100% more inviting and conducive to sitting and chatting after dinner. 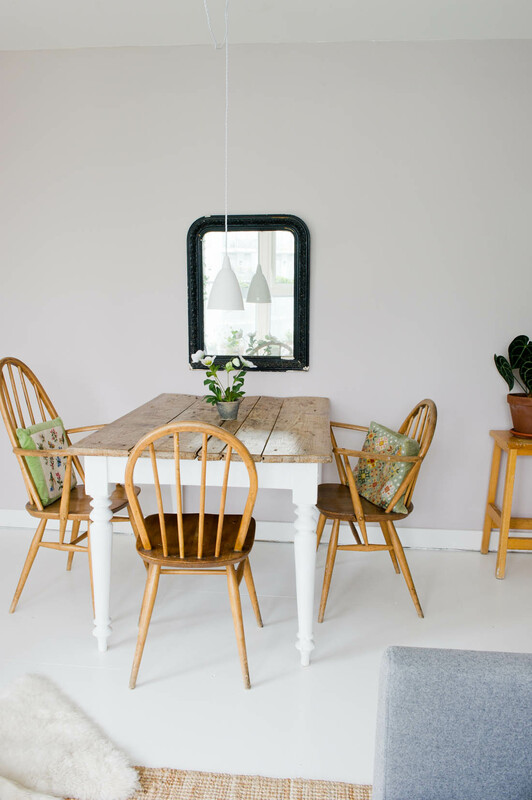 The two wishbone chairs in front of the window are perfect as they don’t block any light and are super comfy if we have a few people over or they can double up as extra dining chairs. I made a pink linen cushion for one of the chairs and have a gorgeous grey cashmere blanket on the other so that there are dots of soft pink and grey on all sides of the room. I kept this white cupboard, which used to be on the other side of the room, as it is great for storage and isn’t too big or heavy, which was the problem with the G-plan sideboard that used to be in this position. The new sofa is a revelation as we can all be comfortable sitting/lying down together (I get the chaise bit, natch!). The grey wool is perfect as it repels dirt when Otto brushes up against it after a muddy walk and it really brings out the grey in the Peignoir wall colour. I love the mid-century style feet and the fact it sits off the ground helps to keep the light flowing around the room. It is long enough to stretch the length of the wall now so makes better use of the space. 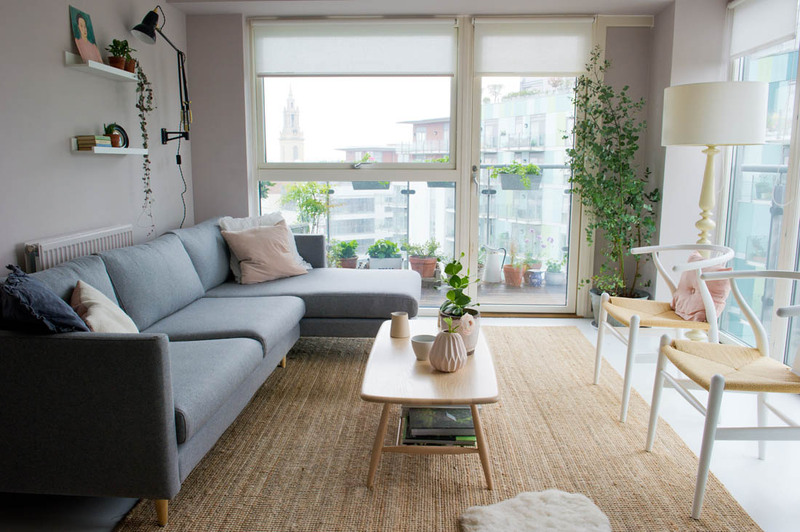 The jute rug is ideal for Otto as it shows no dirt or hair and does not move an inch even without underlay, which is really important as he is constantly rolling around on the floor. 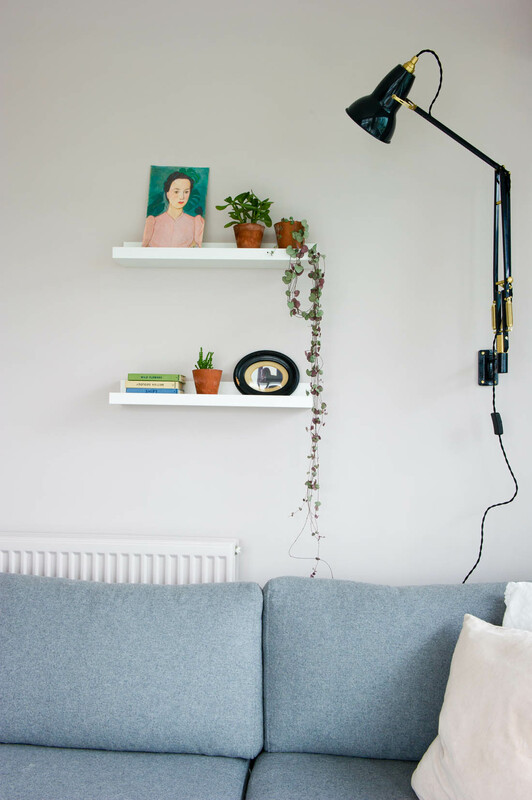 This Anglepoise wall mounted lamp is completely perfect for this space as there wasn’t room for a floor lamp. We can easily move it around to make it a reading lamp or an uplighter for soft even light. I really love it. The new Ercol coffee table is one of my favourite additions to this room. As well as being a very practical size, shape and design, it is beautifully made and works perfectly with the colour tones in this room. I bought the Eucalyptus tree because I love the silvery colour of the leaves, which complements the greys and pinks. The touches of black around the room from the lamp, mirror and this beautiful print from The Future Kept help to ground the scheme and add some contrast. 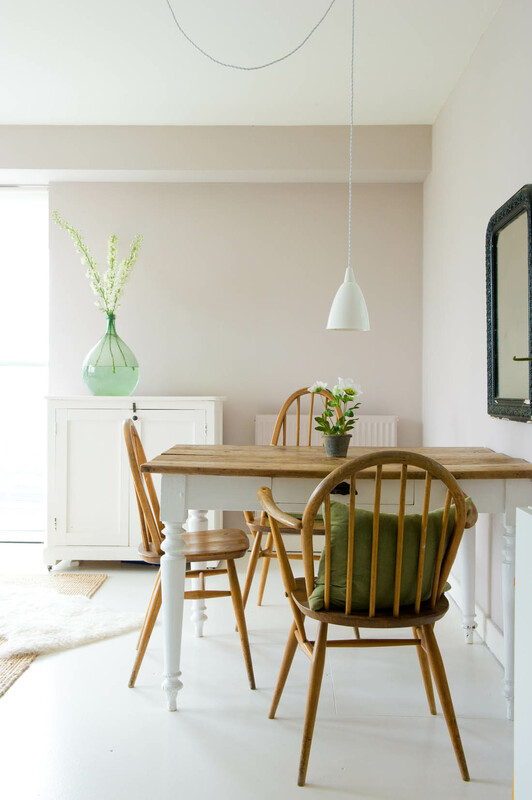 I repainted the floor with Farrow & Ball’s All White floor paint, which helps to keep the Peignoir feeling fresh and modern, whilst the jute rug adds some warmth. I really hope you like what I’ve done to the room; the changes have made the room work so much better than it used to, which is the main thing. Everybody who has visited have said that they love how calm the room feels now and I really feel that on a daily basis. I will show you the kitchen later this week! This is really beautiful! Just the right mix of classic furniture pieces with fresh modern colours. 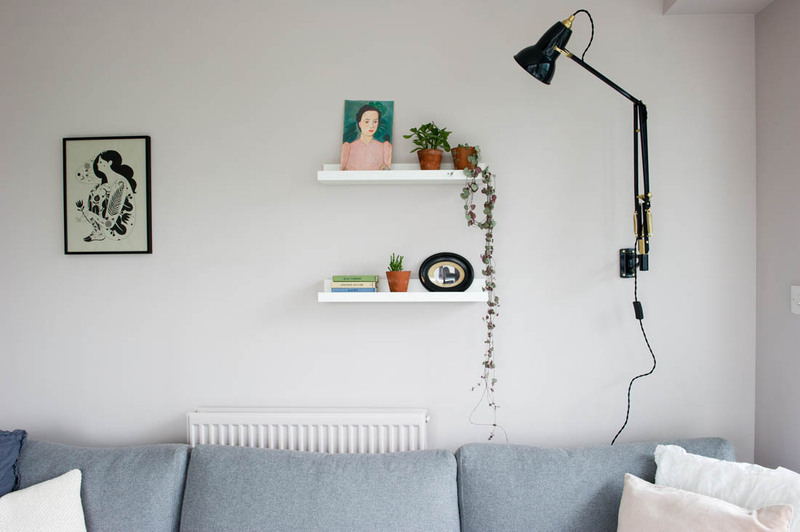 I’ve been working on convincing my other half that we should embrace pale pink in our flat – I will be use these pictures to show him how great it can look! It’s so pretty! Really lovely and light, and love all the greenery. I love it. It’s really beautiful. I’ve been umming and ahhhhing about whether to paint our spare room with something a bit pink or a bit blue and you might have swayed me to the pink. It’s so delicate. And I love how much of the design has been chosen with Otto in mind. I know gray was top of our choice of sofa colour because of Flash’s fur and dirty paws! That paint colour looks great- as does the rest of the room- when I tried it it seemed darker than this but I think your room has more light coming through. Great job! Your living room looks fantastic. I was really interested in your choice of paint as I have earmarked the F&B Peignoir for our bedroom which we are going to overhaul very soon. It looked perfect, even from the pictures on your post. I was also interested to see your Eucalyptus plant indoors. One of my favourite plants so I will try this also. I had a Eucalyptus at my last home and it grew taller than the house!! But I know it can be pruned regularly so I don’t think you’ll be fighting for space. Looks beautiful Katy, and so clean and fresh too. Love how you’ve really made the most of your views. Looks amazing and loving the colour combo. As a fellow dog owner, I’d love to get an update on how the jute rug fares with Otto and mud/damp dog. Its difficult to find a decent sized rug that is a) machine washable and b) actually fit in the machine! Please keep me posted! This is just BEAUTIFUL! You have such a good eye and it looks so clam and cosy too. In love. Looks amazing Katy. You’re a styling icon. This is simply stunning. What a gorgeous space you have created. I am totally and utterly head over heals in love with Peignoir now. It looks completely different in some of your photos. How clever. I would love a room that changes colour with the changing light. That sofa is perfect for your room. What a transformation. I’m loving all the plants and the wishbone chair. That is basically my dream coffee table. One day when the kids stop denting all my furniture with wooden toys. So uplifting. Beautiful! I’m curious about the size of the rug though: the link goes to a B&Q rug that measures 170x120cm but the rug you have is clearly much larger! Does it come in another, bigger size? Absolutely LOVE the finish on this room. I’m really into minimalism and bright airy rooms. I think you’ve done it perfectly with still plenty of character and knicknaks. Can I move in please? Oh Katy, I absolutely love it. The wishbone chairs are completely swoon worthy. I adore the delicate touches but it doesn’t feel at all girly. You must be head over heels. It looks fabulous. I loved it before and was curious how you would improve it but you’ve done it again! It looks so tranquil and uplifting. Thank you for providing us with all the details, great inspiration as always. Oh how I love this post! I’ve pinned it as inspiration.